Here are almost all 10… I am out of Larabars (the horror!). There are tons of different ways you can approach and successfully complete a Whole30. I started by diving head-first into Pinterest and doing obnoxious amounts of research. Two things I found super useful were meal plans (which I will be sharing in the future) and lists of useful staples (and where to find them!). So in that vein, here are my top 10 Whole30 must-haves and where I get them! Almond Butter – I buy the BIG jar (27 oz.) of Kirkland Almond Butter at Costco. Almond butter was an integral snack for me during my first Whole30. I eat it with bananas or apples or just by itself on a spoon! So yummy. Coconut Milk (in a can) – I usually get either Native Forest or Simply Asia brand of organic, unsweetened, full-fat coconut milk. Whole Foods brand is good too, and surprisingly is the cheapest place I have found it. 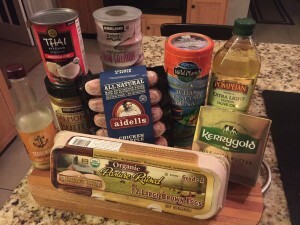 Thrive Market (online) is also a great option for coconut milk and many other Whole30 staples. Take a look and if you want to join, we both can get $25 if you use this link! Grassfed Butter – I use Kerrygold butter to make my own clarified butter/ghee, as I find it cheaper than buying it already made. I get this at Costco or Trader Joe’s, as those are the most cost-effective locations that I have found. Extra Light Tasting EVOO – I buy this in bulk at Sam’s Club or when it goes BOGO at Publix. I make my own mayonnaise, and go through a fair amount of olive oil. I also use my mayo to make really yummy ranch dressing, another staple. Both recipes for mayo and ranch come from The Whole30 book, found here. Canned Tuna – We really like the Wild Planet Wild Albacore Tuna, which we get in packs of 6 at Costco. Tuna salad made with homemade mayo is a quick and easy lunch. Costco’s larger packs of skipjack tuna are pretty good, too. Chicken Apple Sausages – Aidell’s brand Chicken Apple Sausages are great for a quick meal. I really like them sauteed with sweet bell peppers and onions. Best price I’ve found is at Costco, but you can also get them at Publix (and probably other grocery stores). Larabars – I didn’t find a great source for these, because they are not cheap as far as snacks go. But I’ve gotten them from Amazon, Publix and Target. If anyone has a better source, I’d love to hear it. Canned Salmon – I get boneless, skinless Kirkland Wild Alaskan Pink Salmon in packs of 6 cans at Costco. I make salmon patties fairly often, so go through these pretty quickly. Salmon patties are my favorite Whole30 travel food. When I have to travel for work, I make a batch of them, pack them in a cooler with my homemade ranch dressing and cut up carrots, and have a couple of easy-to-eat meals. I use the recipe from The Whole30 book, which uses canned sweet potatoes. It is really yummy. 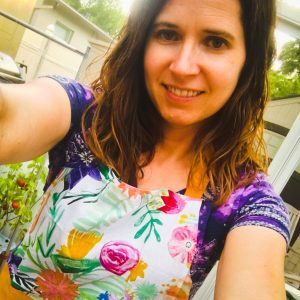 Tessemae’s Dressings & Marinades – Our first round through Whole30, I insisted on making my own dressings, and frankly, they sucked. Once this way of eating became the norm for me, I found Tessemae’s in the refrigerated dressing area of the produce section of Whole Foods and angels began singing. The garlic and lemon one is amazing. Eggs – Yep, we eat a TON of eggs. Hard boiled, scrambled, fried, in quiches and casseroles, you name it. I get mine (organic, pasture raised) from Annie’s Buying Club, which is a great way to get the best for your buck for good quality organic produce (and eggs)! (If you live anywhere in Florida, you can join Annie’s.) When I run out of my Annie’s eggs, I get organic eggs from Costco. Disclaimer – Any brands recommended are named because they are what I used. No companies paid me to use them (unfortunately). If you like other brands, good for you. And if you find more cost-effective, better alternatives, please share the information! « The Whole30 rocked my world. This is fabulous! I have a hard time finding the best deal for our wallet. Thank you for these tips.